With next Sunday Armistice Day it seems appropriate to recall that today is the hundredth anniversary of the death of one of our family’s WW1 soldiers, Jack Young, brother of my husband’s grandfather. Jack – John Percival Young – enlisted in the Australian Imperial Forces on 6 October 1916. On 25 August 1918, while serving with HQ 10th Brigade – taking part in the so-called Hundred Days Offensive, the Allied attacks that brought the war to an end – he was wounded in a mustard gas attack and was admitted to a Line of Communications hospital. Three days later he was invalided to England, sent to Beaufort Hospital near Bristol. He was discharged from Beaufort after a month, but within a few weeks he was back in hospital, the 3rd Auxiliary Hospital Dartford. 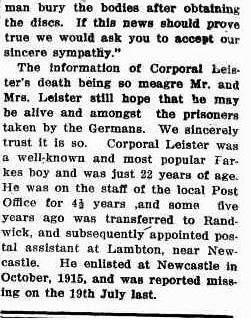 On 9 November 1918, two days before the war ended, Jack died of influenza and pneumonia. He is buried at Brookwood Military Cemetery. Group portrait of the Signal Section of the 10th Infantry Brigade, outside the Chateau at Querrieu, 7 July 1918. Pte J. Young is in the back row eighth from the left (fourth from the right). 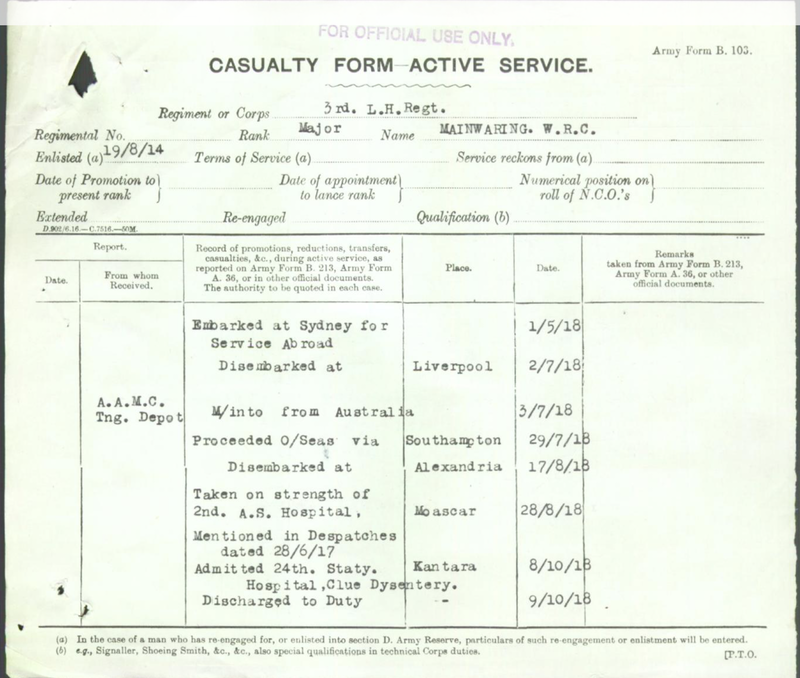 My husband Greg’s maternal grandfather Arthur Sullivan (1891-1975) enlisted in the Australian Army on 22 July 1915. He had married in 1913 and had two small daughters. Photograph of Arthur and his wife Stella and their two eldest daughters Lil and Vi. From the collection of one of Greg’s cousins. 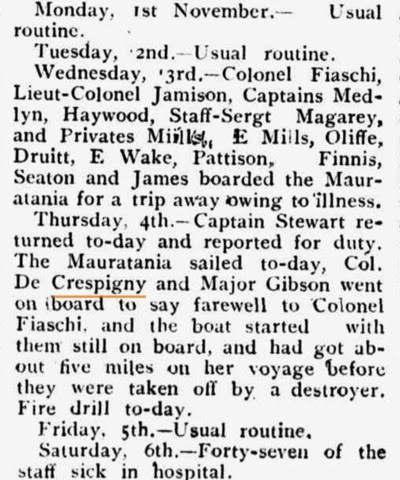 The Gallipoli landings were reported in the newspapers in May 1915. Recruiting advertisements began to appear, offering attractive rates of pay, including additional amounts for wives and children. 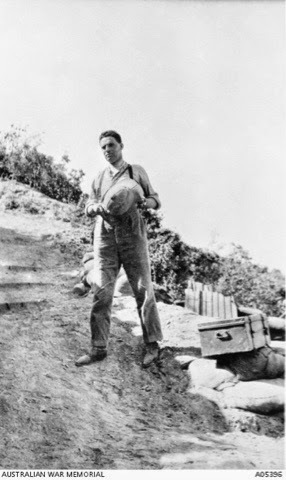 Arthur served on the Western Front as a sapper with the Fifth Pioneers. 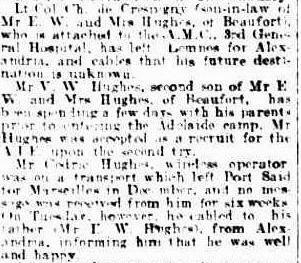 He returned to Australia from France in February 1918, invalided out with ‘debility’. His daughter Marjorie (1920-2007), Greg’s mother, told me that her father suffered from shell shock after the war. As a little girl she was given the task of sitting with him when he got the horrors. 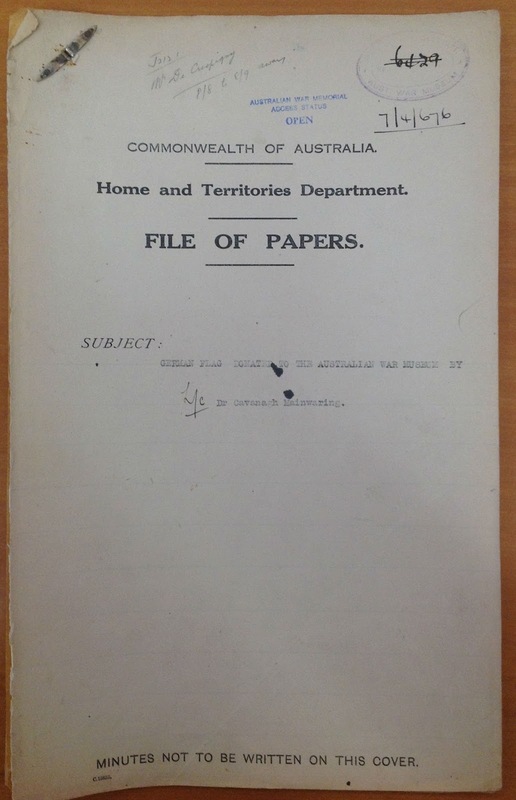 I viewed Arthur’s repatriation files in the National Archives at Melbourne. In 1931 Arthur was reported as suffering from a problem with his hands. The letters and reports of examination are extensive. His physical problems were deemed to be unrelated to his war experiences, however, and so he was granted only a minimal pension. Arthur is described in the files as a very thin grey-haired man. He was only 40. The Great Depression, of course, came next, but Arthur and his family saw it out, and he lived in modest comfort with his wife Stella, mostly in Castlemaine, Victoria. They died in 1975: Arthur died on 11 September, 23 days after the death of Stella. My great grandfather Constantine Trent Champion de Crespigny (1882-1952) served as a doctor in World War 1. 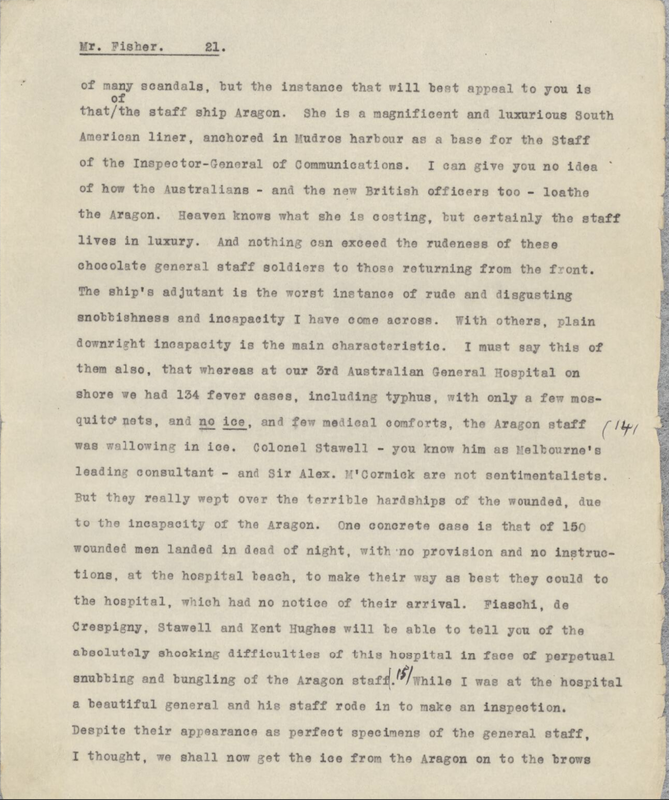 In 1917 he was in charge of the 1st Australian General Hospital in Rouen which dealt with general battle casualties. 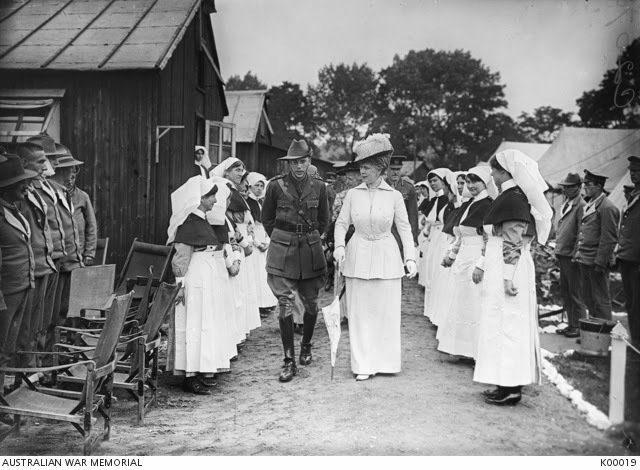 On 9 July 1917 Her Majesty Queen Mary visited the hospital. She was photographed with my great grandfather inspecting an honour guard of nurses. 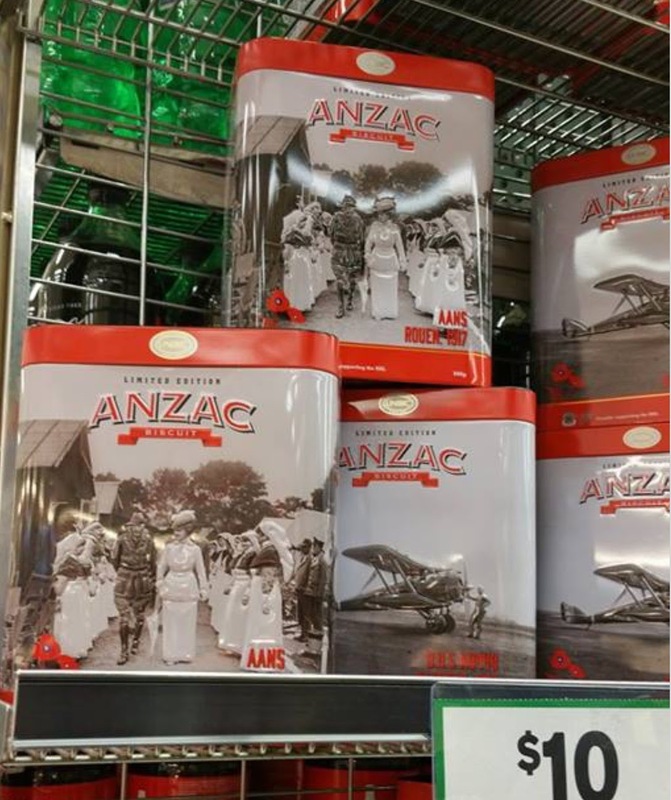 The tins are filled with Anzac biscuits. 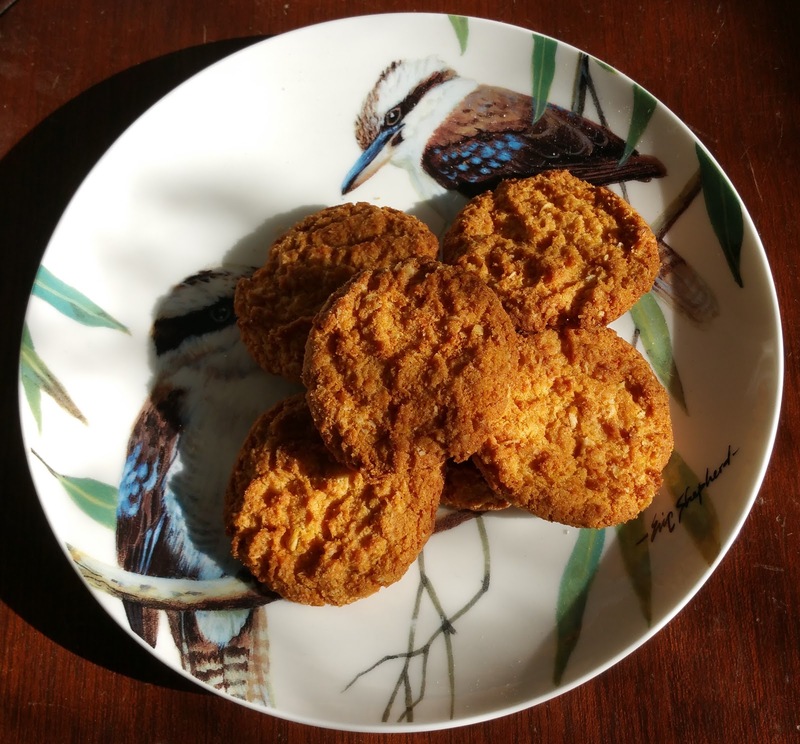 The biscuit company promises that from the sale of the tins, which ‘celebrate the origin of Anzac biscuits, reminding us of the packages of love and care from home that helped buoy the Anzac Spirit in the trenches of Gallipoli’, will go towards service organisations such as the Returned and Services League (RSL). 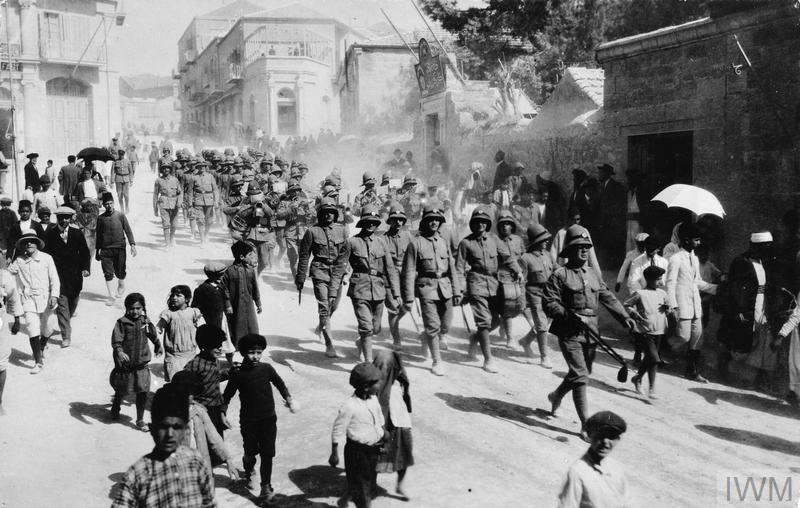 Dr de Crespigny on behalf of the hospital at Lemnos dealing with the sick and wounded from Gallipoli, received tins of biscuits from Australia. 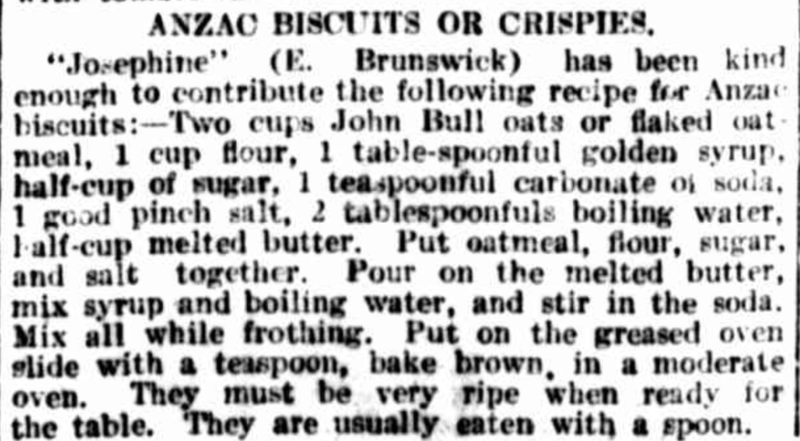 The biscuits were probably not the Anzac biscuits we know today. 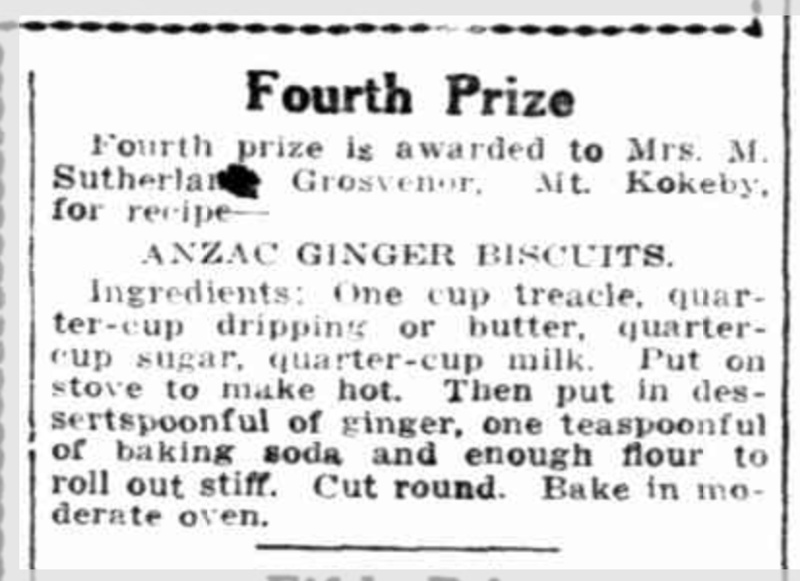 One of the earliest Anzac biscuit recipes was in a 1916 newspaper, winning 4th prize in a Western Australian recipe contest; 4th prize was an electroplated butter knife with an engraved handle. This 1920 recipe from the Argus is much closer to the recipe I have made. I don’t know about eating the biscuits with a spoon though. 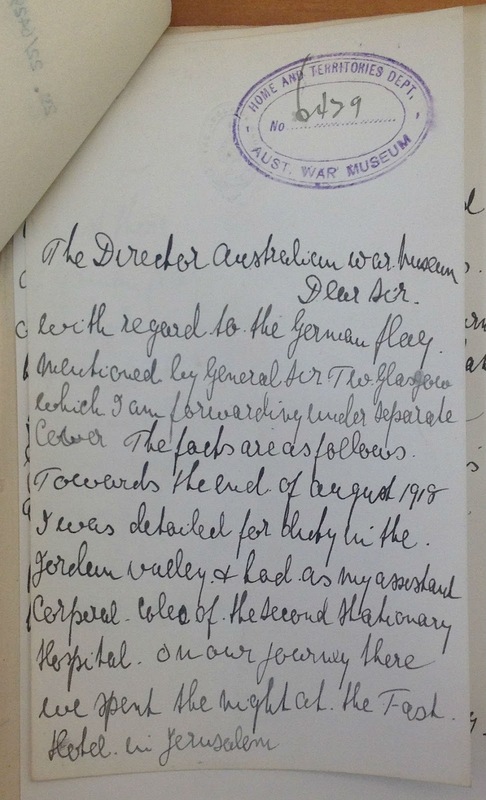 In September 1915 the journalist Keith Murdoch (1885 – 1952) wrote to Andrew Fisher Prime Minister of Australia giving his views on the conduct of the Gallipoli campaign. 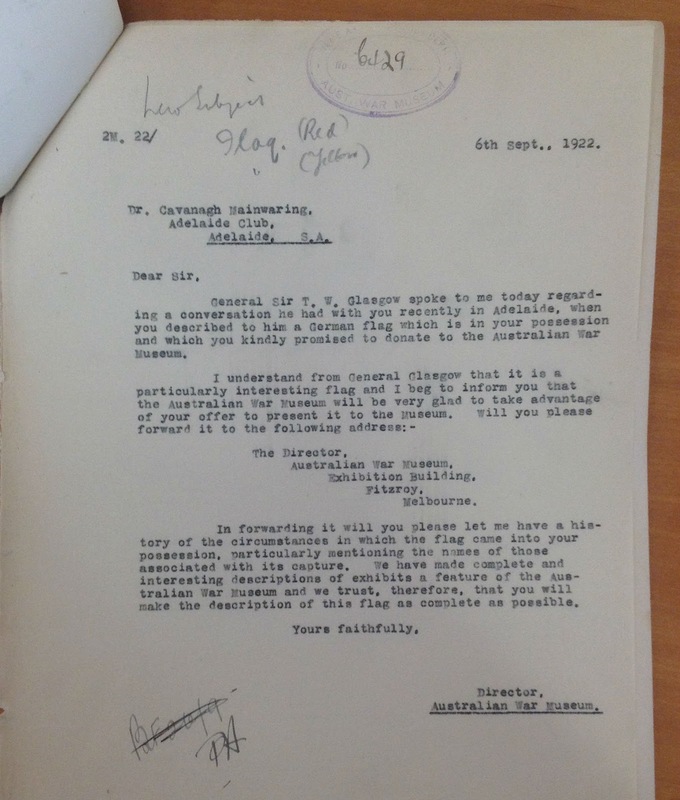 Murdoch’s letter has been digitised by the National Library of Australia. 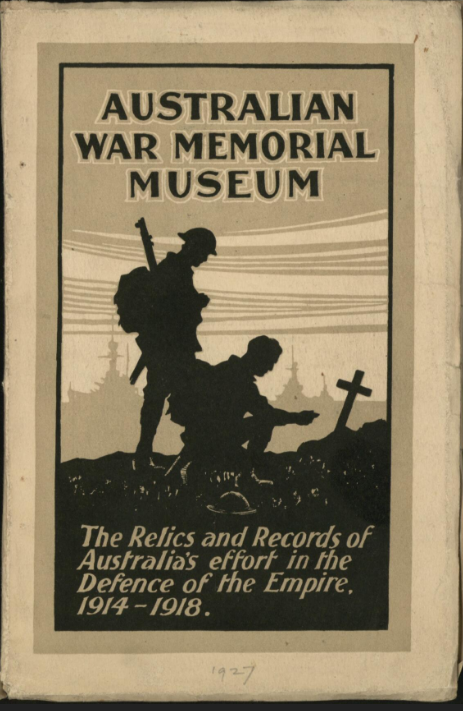 According to the Australian War Memorial the letter contained many errors, but it was seen by the Australian Prime Minister and led to the ending of the Gallipoli campaign. Australians now loathe and detest any Englishmen wearing red. Without such a purification of motive as will bring youth and ability to the top, we cannot win. I could tell you of many scandals, but the instance that will best appeal to you is that of the staff ship Aragon. She is a magnificent and luxurious South American liner, anchored in Mudros harbour as a base for the Staff of the Inspector-General of Communications. I can give you no idea of how the Australians — and the new British Officers too — loathe the Aragon. Heaven knows what she is costing, but certainly the staff lives in luxury. And nothing can exceed the rudeness of these chocolate general staff soldiers to those returning from the front. The Ship’s adjutant is the worst instance of rude and disgusting snobbishness and incapacity I have come across. With others, plain downright incapacity is the main characteristic. 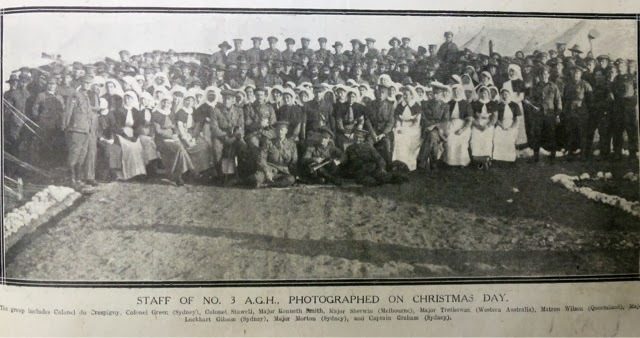 I must say this of them also, that whereas at our 3rd Australian General Hospital on shore we had 134 fever cases, including typhus, with only a few mosquito nets, and no ice, and few medical comforts, the Aragon staff was wallowing in ice. Colonel Stawell — you know him as Melbourne’s leading consultant — and Sir Alex M’Cormick are not sentimentalists. Ice for the officers aboard the Aragon … none for the wounded men. But they really wept over the terrible hardships of the wounded, due to the incapacity of the Aragon. One concrete case is that of 150 wounded men landed in dead of night, with no provision and no instructions, at the hospital beach, to make their way as best they would to the hospital, which had no notice of their arrival. Fiaschi, de Crespigny, Stawell and Kent Hughes will be able to tell you of the absolutely shocking difficulties of this hospital in the face of perpetual snubbing and bungling of the Aragon staff. Real need … the hospital at Lemnos, where nurses and medics do their best with incoming injured. While I was at the hospital a beautiful general and his staff rode in to make an inspection. Despite their appearance as perfect specimens of the general staff, I thought, we shall now get the ice from the Aragon on to the brows of our unfortunate men. But no ice appeared next day. The navy is very good, and sent some comforts and ice across, but for the three days before my visit this ice had gone astray before it reached the hospital. The Miss de Crespigny who donated the canaries was probably my 3rd-great-aunt Viola Julia Constantia Champion de Crespigny (1855-1929). The canaries were raffled to raise funds for the war effort. 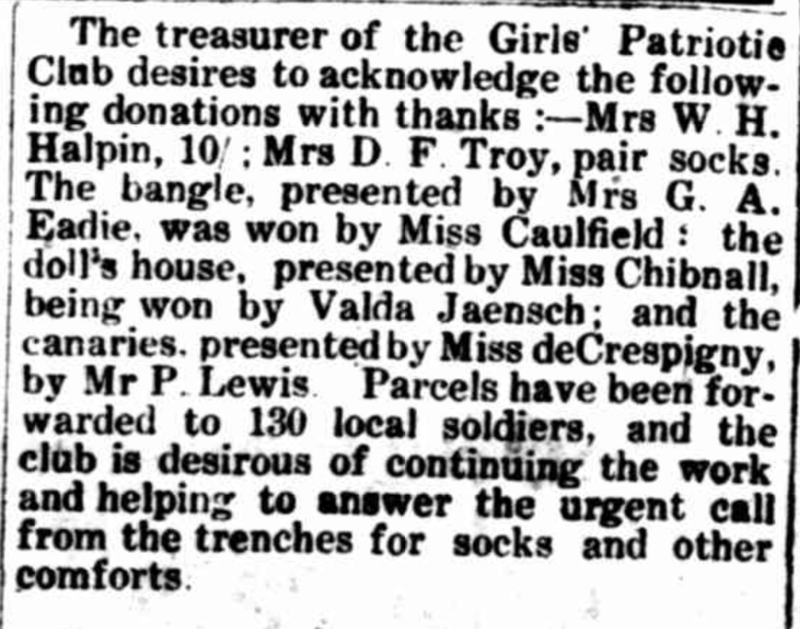 The Beaufort Girls’ Patriotic Club forwarded comforts parcels, including parcels of socks, to 130 soldiers from the district. 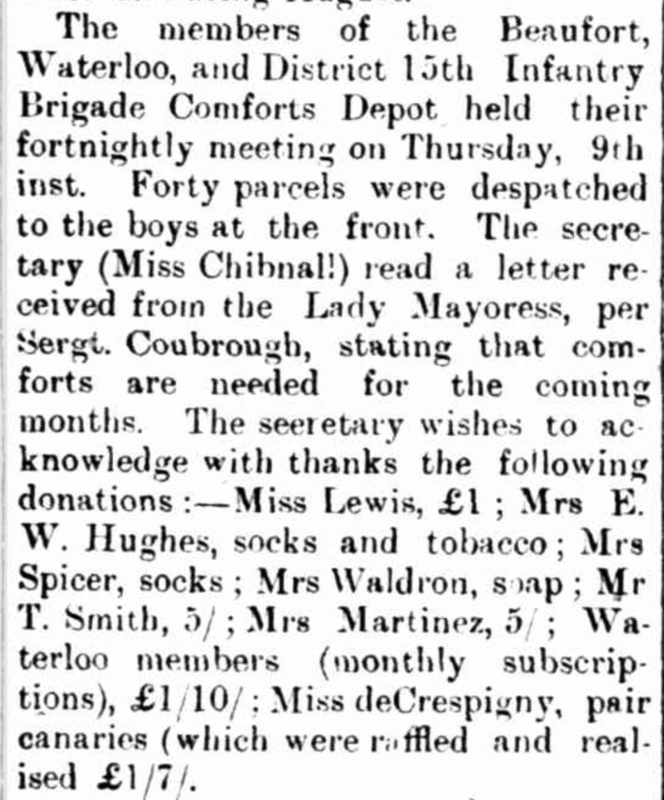 Later in 1917 Miss de Crespigny donated another pair of canaries to the Beaufort, Waterloo, and District 15th Infantry Brigade Comforts Depot. Mrs E.W. 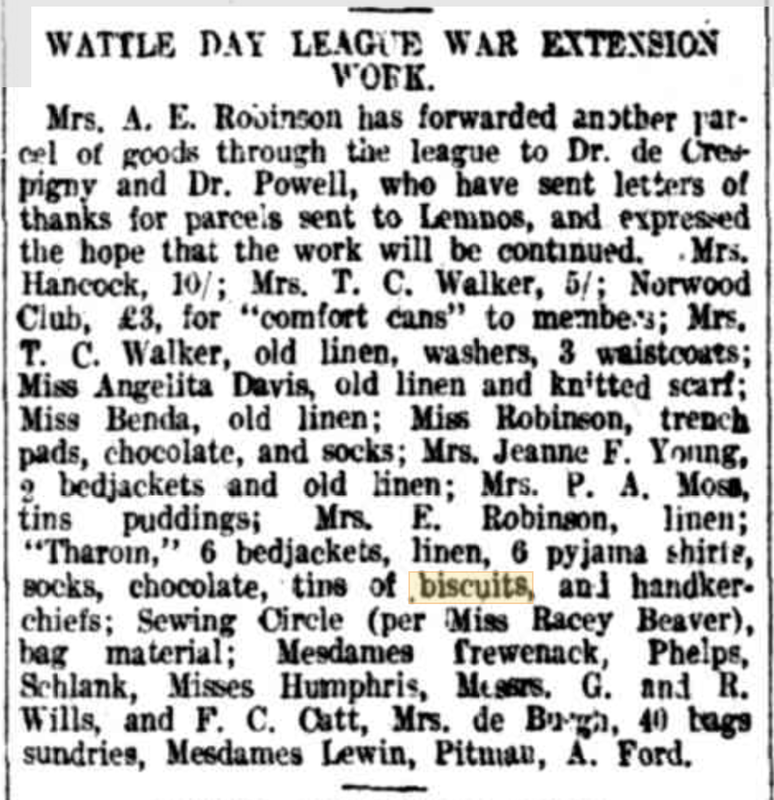 Hughes, wife if the bank manager (my great great grandmother) also made a donation of socks and tobacco. I have 4 beautiful young canaries and the other little hen sitting. Rose has 10 young ones I have to look after. Charlotte had two sons, Philip (1850-1927) and Constantine (1851-1883) and three daughters, Ada (1848-1927), Viola (1855-1929), and Helen Rosalie, called Rose (1858-1937). Rose married Francis Beggs and lived at Eurambeen and St Marnocks near Beaufort. Would you very much mind putting my big canary cage under the tap and clean it for the poor little birds when I come. They will be so crowded I shall have to put them in a bigger cage till I sell them. I believe Charlotte was at Eurambeen and writing to Ada in Melbourne. It seems from the letters that Viola also lived at Eurambeen with her sister Rose and mother and brother-in-law. On the 1914 electoral roll Viola is listed as living at St Marnock’s, Beaufort. At the same property were Francis and Helen Rosalie Beggs. On the 1903 roll Francis and Rose Beggs and Viola and her mother were living at Eurambeen near Beaufort. Philip Champion de Crespigny (1879-1918) enlisted in 1918, served with the Light Horse and was killed in action in Palestine. Constantine Trent Champion de Crespigny (1882-1952) enlisted in 1915and served as a doctor. Francis George Travers Champion de Crespigny (1892-1968) enlisted in 1917 and served as a doctor. Hugh Vivian Champion de Crespigny (1897-1969) enlisted in 1914 but resigned shortly thereafter and joined the British Air Flying Corps. Beatrix’s third brother, Reginald Hughes (1886-1971) was rejected for enlistment on medical grounds. Besides these close relatives there were almost certainly many other relatives and friends who served. 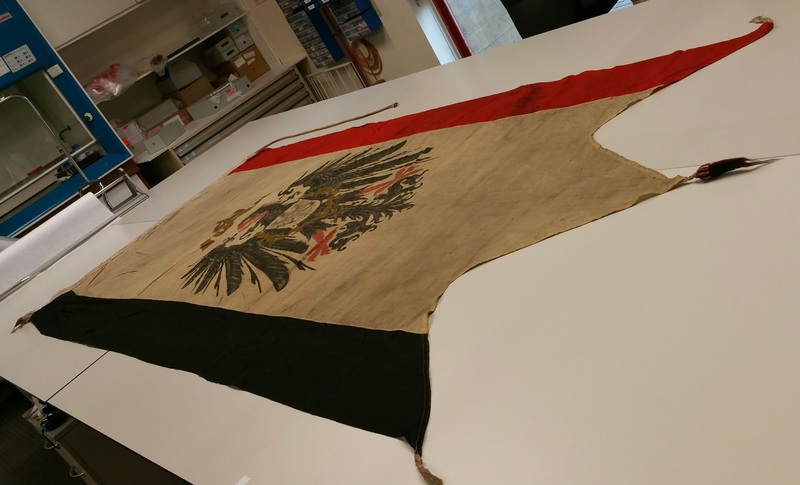 Among the trophies, relics, and souvenirs held by the Australian War Memorial in Canberra is a large German swallow-tailed flag donated in 1922 by Major Wentworth Mainwaring. 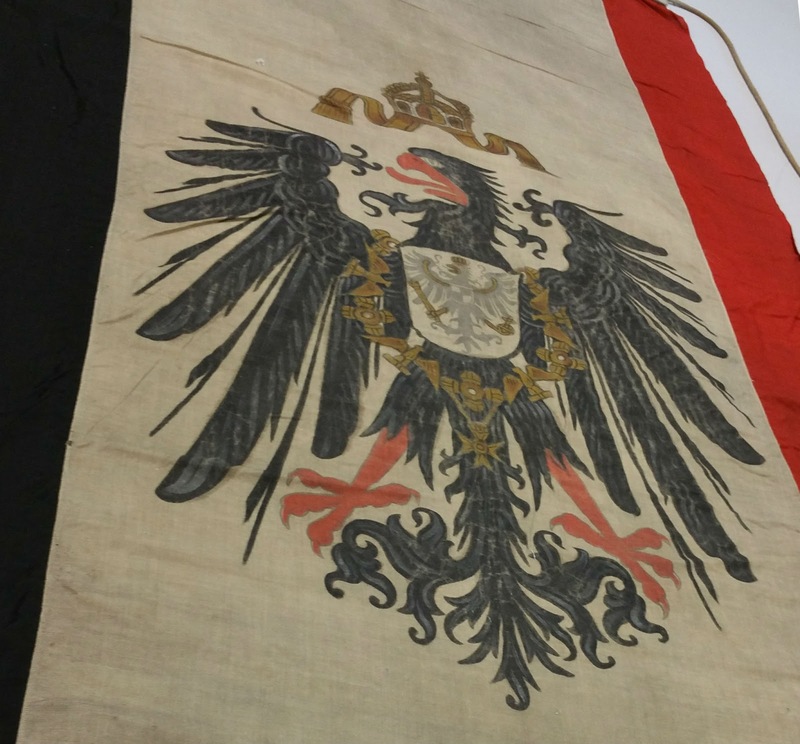 German banner from Jerusalem donated to the Australian War Memorial by Major Mainwaring 1922. Viewed 30 November 2016. Accession number RELAWM01545. Wentworth Rowland Cavenagh-Mainwaring (1869-1933), known in the family as Wenty, was my great-great uncle. He served in the Middle East from 1914 firstly with the 3rd Light Horse and later with the 2nd Stationary Hospital.. 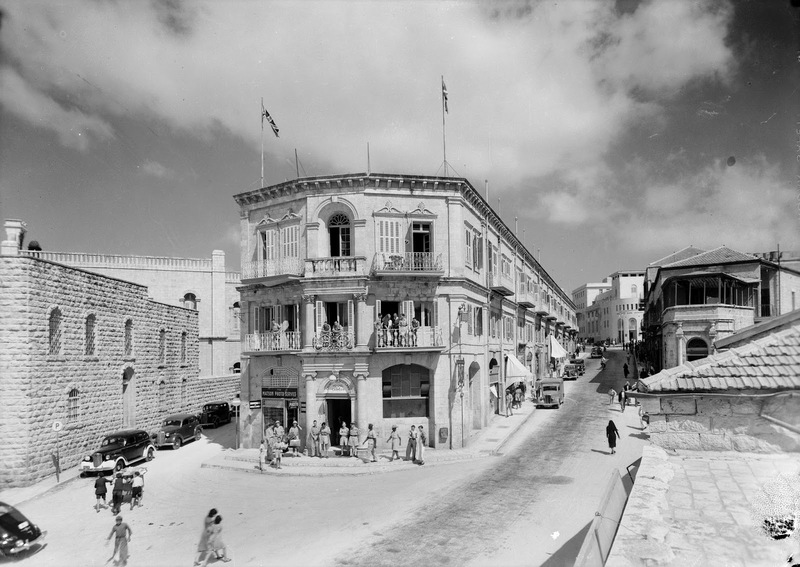 According to Mainwaring’s account, the flag came into his hands in August 1918, when he was briefly billeted in a Jerusalem hotel called the Hotel Fast, which had been occupied by members of the German general staff before their withdrawal to Nablus in November the year before. The story has the flag rescued from being about to be burned by Corporal Cole. 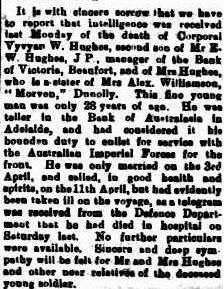 Corporal Cole was probably Thomas Elgin Cole sern 8696 who served with the 2nd Australian General Hospital. It was quite a souvenir. The flag, large, made of wool with a painted eagle, hung in Kathleen’s parents’ house in Pennington Terrace in Adelaide for a few years until it was donated to the War Memorial. The flag is not on permanent display, but my brother and I were recently given a private showing. Nearly a hundred years after Wenty souvenired his enemy flag, it is still in excellent condition. The Fast Hotel in 1917. The War Memorial initially associated the flag with General Von Falkenhayn. The flag was displayed in the 1920s. 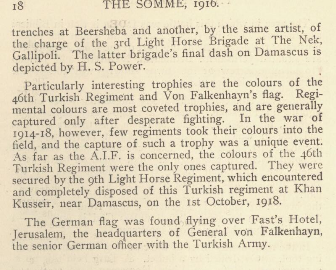 It seems unlikely that the flag was von Falkenhayn’s. The curator at the War Memorial suggests it is a German foreign office flag. 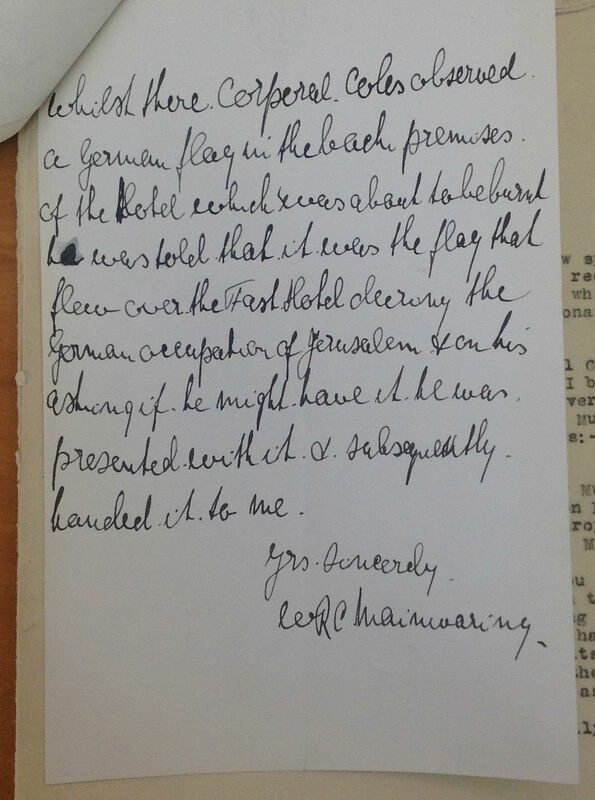 So it seems that the Fast Hotel had probably housed members of the German diplomatic corps, not the military officers. 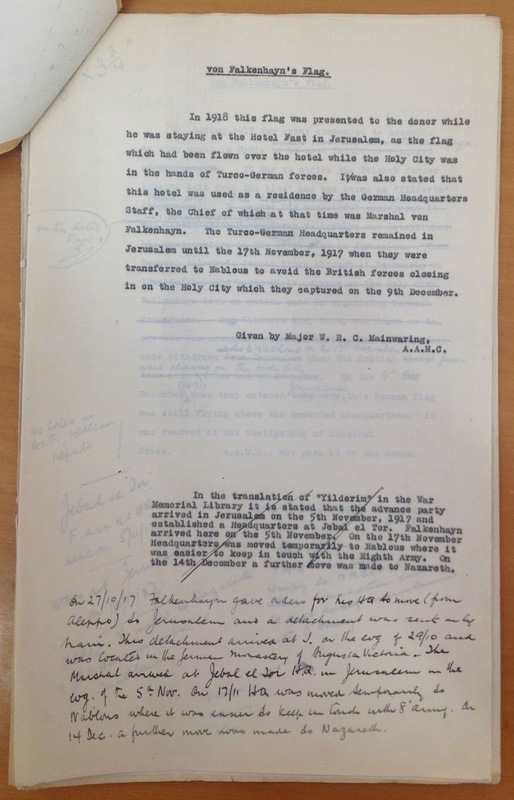 Wentworth Cavenagh_Mainwaring travelled through Jerusalem in August 191 on his way to take up a post with the 2nd A.S. Hospital. The Fast Hotel is no longer standing. It was associated with the Australian Imperial Forces in World War 2. 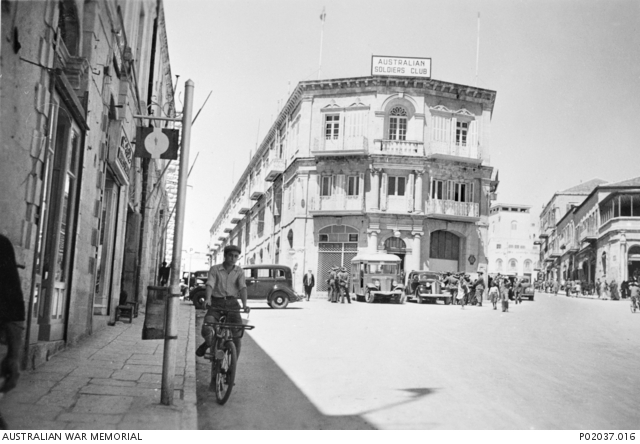 St. Andrew’s House (Fast Hotel), taken July 2, ’43 by Matson Photo Services. Retrieved from Library of Congress. 3 February 1941. 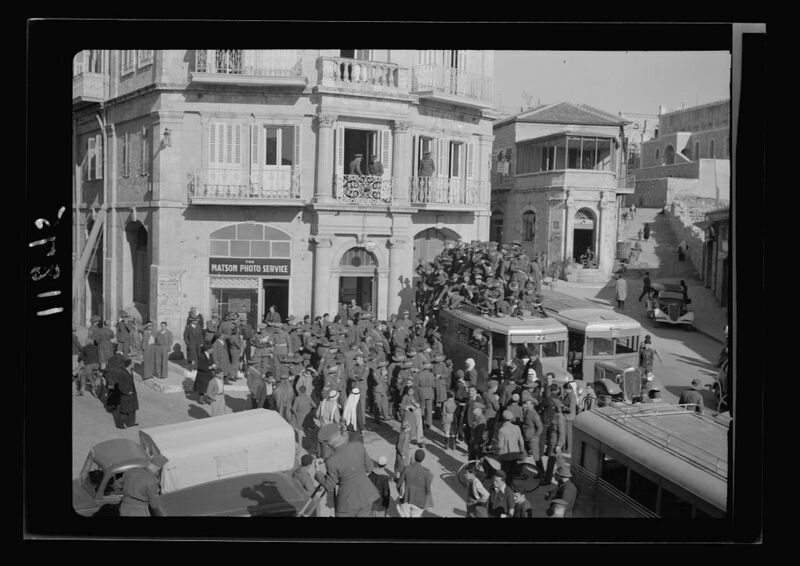 Aussi [i.e., Australian] soldiers cheering Menzies & Blamey. Photograph by Matson Photo Service. Photo shows the Matson Photo Service store on first floor of building (formerly the Fast Hotel). Photo retrieved from Library of Congress. National Archives of Australia: Australian War Memorial; AWM93, Australian War Memorial registry files – First series; 7/4/676 German Flag Donated to the Australian War Museum by L/C Dr. Cavenagh Mainwaring. The accession number of the flag is RELAWM01545. It is not currently listed online. Yesterday we visited Beaufort, 50 kilometers west of Ballarat. 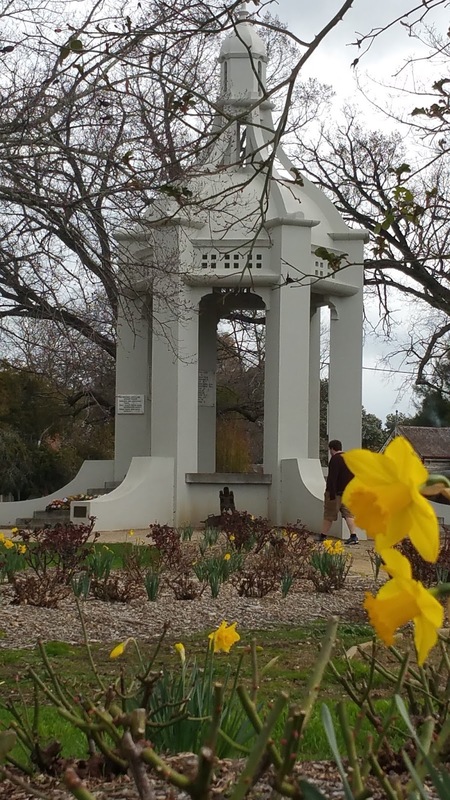 The daffodils planted around the War Memorial were at their best. 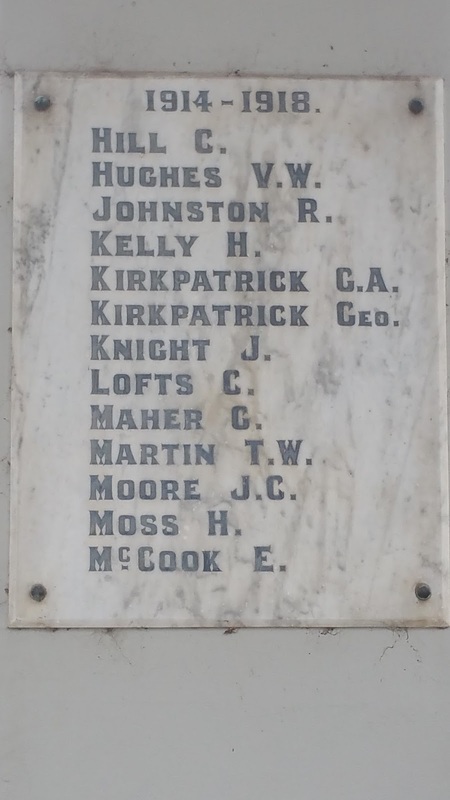 On the memorial I noticed the name of my great great uncle Vyvyan Hughes (1888-1916). I have previously written about his war service and death. The Hughes family had two sons and a son-in-law serving in World War I. The son-in-law was my great grandfather Constantine Trent Champion de Crespigny. Vyvyan and Olive Hughes shortly before Vyvyan’s departure in April 1916. 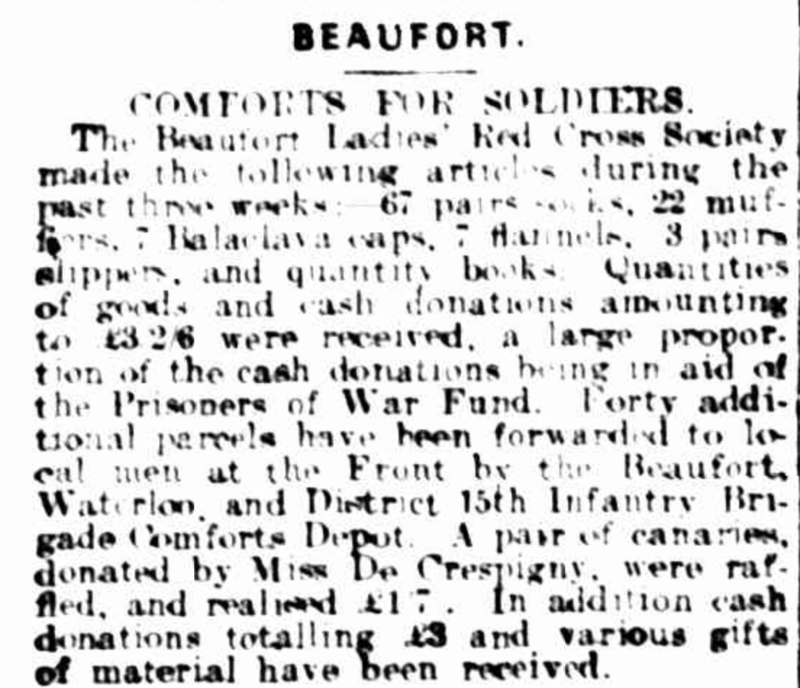 In August 1918 an Avenue of Honour of 500 deciduous trees was planted at Beaufort. The war service of both Vyvyan and his brother Cedric was commemorated in this avenue. Each had a tree. 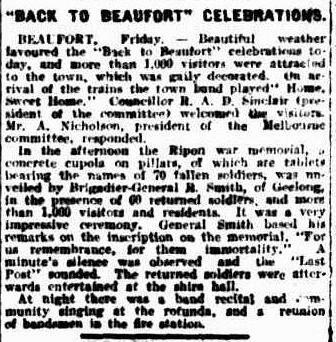 The Beaufort War Memorial was unveiled in 1927 by Brigadier-General Robert Smith, formerly of the 5th Brigade, AIF. Vyvyan Hughes was one of 70 fallen soldiers whose names are recorded on the memorial. In the Victorian Heritage Database the Beaufort memorial is said to be a one-third size replica of the Salisbury Plains memorial. 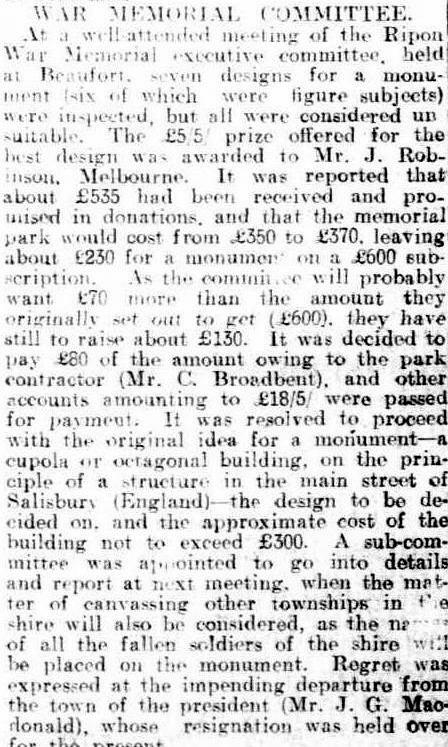 In fact the design is based on a monument called the Poultry Cross in the main street of the city of Salisbury. The Poultry Cross is a market cross constructed in the 14th century and modified in the 18th century. Leslie Leister (1894-1916), the half-brother of my husband’s grandfather, was one of the 2,000 soldiers killed at the battle of Fromelles one hundred years ago on 19 and 20 July 1916 and one of the 250 soldiers who were buried in a mass grave by the Germans after the battle. 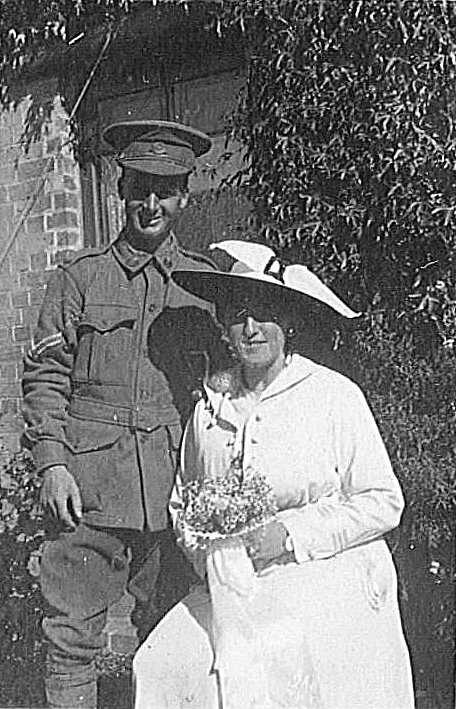 I have written before about Leslie at F is for Fromelles and about the delays in his parents finding out about what happened to him at K is for King and Country . 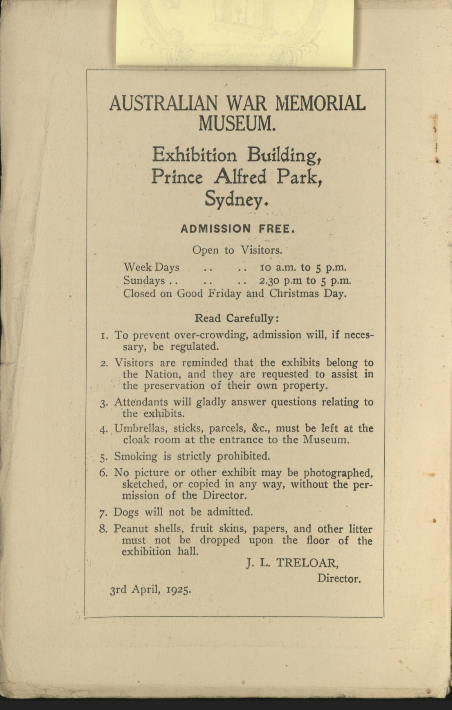 There are now more newspapers digitised and available through Trove. Among more recently digitised newspapers is the Western Champion from Parkes, New South Wales, Leslie’s home place. The Western Champion includes a photograph of Leslie in its article about Leslie’s fate. The article also explains the creation of the list that Leslie was included on which was compiled by the Germans from the identity discs of the soldiers they buried. It was only in late 1916 that soldiers were issued with two identity discs. When the Germans buried Leslie and the other soldiers they took the identity discs to compile the list and notify the British that they had done so. Thus there was no disc with the body. In 2010 Leslie was among the soldiers identified when the mass grave created by the Germans in a hurry during the battle was excavated. A cousin’s DNA was used to identify him. He has been reburied in the new cemetery at Fromelles. The inscription we chose for his grave is the same one used to remember him on his family’s grave at Parkes.